Basseterre, St. Kitts-The number of cruise passengers visiting St. Kitts in 2017 is anticipated to fall short of the one million mark this year according to Tourism Minister Lindsay Grant. Mr. Grant explained that there is a schedule and the numbers each ship is scheduled to bring has been calculated and they were expecting to meet the million passenger mark. “They would continue coming as per schedule but the only problem is sometimes you have a cancellation because of weather or different deployments,” he said. Grant stated that though they still may reach the 1 million they might fall short by 10-15 thousand which in the scheme of things he described as insignificant. He said it is anticipated that in 2018 and 2019 the passenger mark will be larger, adding that next season tourism officials expect to exceed 1.2 million and the following year should hit the 1.4 million mark. The tourism minister also urged the stakeholders of the industry to come up with ideas to keep the industry moving forward. “We need to think outside the box think about a new tour because the cruise ships are always looking for new tour so somebody needs to come up with a bright idea and make some money. People need to start to think to what can we do to attract the numbers,” he said. He mentioned the Scenic Railway as an example of a unique idea that can bare significant fruit. “Nobody knew years ago the sugar train as it is now would be so significant. It is one of the premier tours of the 35 jurisdictions. Somebody needs to come up with a bright idea,” he said. It was just last week the Federation welcomed the largest cruise liner in the World in the Harmony of the Seas which brought over 6,000 passengers and 2,000 staff to St. Kitts and Nevis. 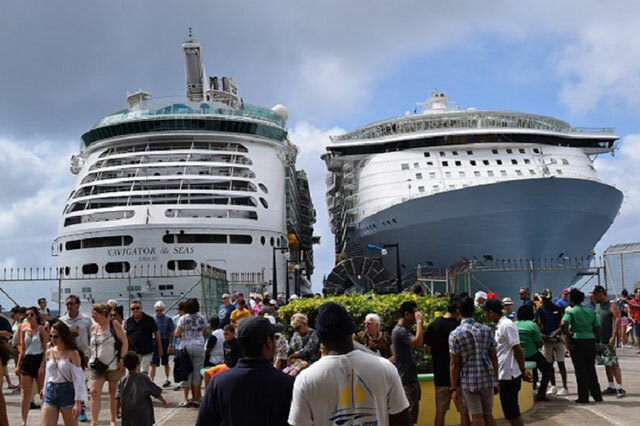 Earlier this year, the island surpassed another milestone as a record breaking five cruise ships with over 16,000 passengers berthed in Basseterre on January 12. The Adventure of the Seas of the Royal Caribbean Cruise Line, Regal Princess of Princess Cruises, Aida Luna of Aida Cruises, Freedom of the Seas of the Royal Caribbean Cruise Line and TUI Discovery of Thomson Cruises all anchored in Basseterre on that day.